Danish Carl Nielsen Music Academy in Odense has become quite popular among young Polish students lately. Thus the tradition of Polish-Scandinavian jazz links, dating back to Krzysztof Komeda times, is continued and not only by great masters like Tomasz Stańko (check his last "Dark Eyes" with new quintet) but also by young generation. Let me then briefly introduce players: Tomek Licak plays on tenor saxophone while Artur Tuźnik on piano. This is their second recording made together, of which I am aware of, after last year debut album "Last Call". That recording session was a prize for winning in the Bielska Zadymka Jazzowa festival. I wrote a favourable review of this album which featured Scandinavian rhythm-section (Emil Brun Madsen, Rasmus Schmidt) and was assertive mainstream jazz with clear hard bop roots. With minor changes, Tomek Licak replaced by saxophonist Maciek Kądziela, this group won this year in another top festival in Poland namely Jazz Nad Odrą (check this link for details). 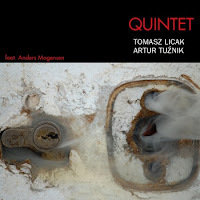 On "Quintet" we see following changes in personnel: rhythm section remains Scandinavian but musicians changed to Andreas Lang on bass and Anders Mogensen on drums plus Tomek Licak is joined by Tomek Dąbrowski who is rising star among Polish young trumpeters noted already by promising play in Magnolia Quartet or in OFF Quartet (review of this album soon on our blog). All above mentioned musicians are either students or teachers (Mogensen) at Odense.